Anyone in Canada who wanted to get their 'augmented reality' fix with Google Glass, instead got a disappointment when it was announced that this new technology would only be available in the United States. Don't fret, though, because in this fast-paced techno world, it's not going to be long before someone steps in to fill that kind of gap. 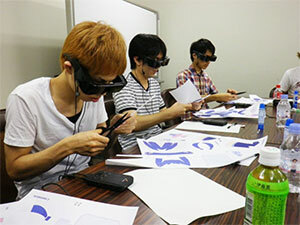 In this case, it's the printer company Epson and Edmonton company Scope Technologies that are stepping in, turning Epson's Moverio BT-100 head-mounted display into the Scope Augmented Reality Guided Training System. Moverio is similar to Google Glass, in that it's a hands-free display that's worn like a pair of glasses. It was originally marketed to be a wearable display for Japanese commuters — allowing them to watch TV or movies while still keeping their heads up so they wouldn't miss their stop. "Being able to have a transparent, hands-free, big-screen solution on the go — there's quite the market for that," said Eric Mizufuka, product manager of Moverio at Epson America in Los Angeles, according to CBC News. Here Scope has turned Moverio into a training system that can walk a user through any process, step by step, showing exactly what to do by overlaying images onto what the user is seeing in reality. The user only needs to follow those steps, exactly as they're shown, to perform the desired task. Moverio operates on the Android operating system, so applications can be downloaded to watch movies and TV, and it's open for developers to take advantage of, to produce dedicated applications for whatever purpose they need. According to the CBC News article, Andrew Hogue, a researcher at Oshawa's University of Ontario Institute of Technology is using it to develop video games, and he sees it becoming useful in medical training as well. Users would not only see instructions in real time (like in the above video repair demo), but each person's glasses could incorporate the actions of everyone else on the team, as they performed the medical procedure together. Moverio is available to buy right now, from the U.S. Epson website, and it will set you back about $700 (although it looks like you need to need to contact the company to inquire about buying one). This is compared to the $5,500 cost (and zero Canadian availability) of Google Glass. I'm not sure I'm up to paying that much for a piece of technology right now, but I have to admit that this stuff is pretty cool and the potential for this tech is incredible. I may lament being born "too early" some times, because I want to be in a technologically advanced civilization that travels the stars, but it's still great to be here see this kind of stuff jump off the pages of science fiction and into science reality.